Drive's deluxe walker features a trigger release mechanism that makes opening and folding the walker easy for all users. The triggers allow the user to close the walker without removing his or her hands from the handle, making the walker ideal for individuals with limited finger dexterity. 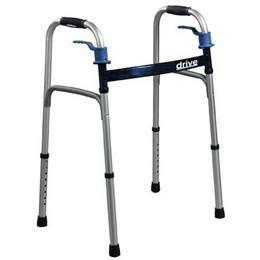 The walker also sports an attractive design with blue accents and a glossy finish. For additional product information, including more detailed pictures with labels and descriptions of features, more product information, and technical specifications, click on the Product Detail PDF located below, under the Additional Resources tab. Width (inside hand grips): 18"
Width (inside back legs): 21"
Depth (opened at base): 18"
Seat height adjustment range: 32" to 39"
Depth (opened at base): 17"
Seat height adjustment range: 25.5" to 32.5"
Product weight : 6.2 lbs. Depth (opened at base): 21.5"
Seat height adjustment range: 32.5" to 39.5"
Depth (opened at base): 19"
Seat height adjustment range: 26.5" to 33.25"